Radio Flyer is known for its high-quality products, and they are aware what their customers want. They are manufacturing innovative portable wagons that are very helpful to people. One of their sought-after products is the Radio Flyer 3 in 1 Folding cart, which is available in 3 different modes. The wagon collapsible thus you can carry it anywhere you want. The company has been launching some products focusing on childhood fantasy for 100 years. They have manufactured beauty and simplicity as their top priority. Radio Flyer has set the high standards of safety to promote adventure and discovery and let the kids enjoy their time as a child. Every year, the company is making a big step in its production. And because of this, it continues to get more and more customers. 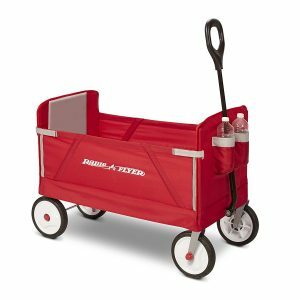 If you are in search of a high-quality product at affordable price, then it is best to buy only a Radio Flyer product like the Radio Flyer 3 in 1 Folding Wagon. It has a Dura Clean fabric that is not only sturdy but is also easy to clean. All you need is to wipe it with a clean cloth. 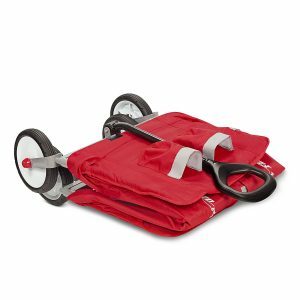 The Radio Flyer wagon has a magnet that holds the handle upright so you can store it conveniently when not in use. Has storage loops that you can use to store the accessories or personal belongings. It is found at the back of the wagon. The product has a thick padded seat cushion to provide comfort. 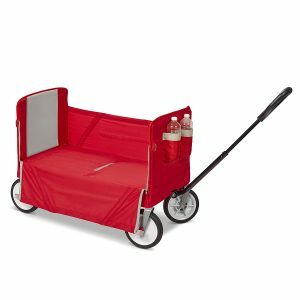 The Radio Flyer Wagon has 3-in-1 design ideal for rider seating, hauling, and for bench seating. Zippers and Safety straps on the side panel, to keep everything you put there secured. You can transform the wagon into bench seating. To hold your drinks, it has two cup holders in front. For easy transport, Radio Flyer has a telescopic handle. Carrying and storing it anywhere is not a problem because it is convenient. If you are looking for a foldable wagon that can haul everything from kids toys to groceries, the Radio Flyer 3-in-1 is what you need. You can transform it into seats without any difficulties. It has 2 cup holders where you can place your drinks. As a whole, this product is very versatile.